There are at least two versions of this game: the Milton Bradley version released in the United States and the John Sands version manufactured in Australia (pictured). 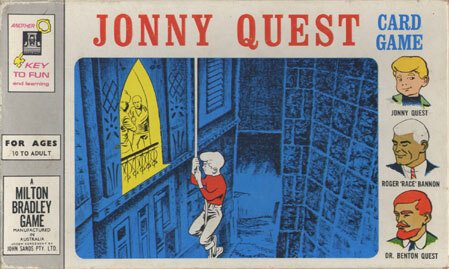 The game itself has little to do with Jonny Quest. The cards are numbered from 1-40 with two wildcards. Each player gets five cards to start, and the next two cards become the "high" and "low" cards placed in the tray. You draw a card. If you have a card with a value in between the high and low, you place it in the tray, creating either a new high or low, plus you can discard any other card in your hand. (Wildcards can be any value between 1 and 40.) If you don't have a card falling in between the high and low, you put one card in the tray anyway but cannot do the extra discard. The round ends when one player is out of cards. He gets one point for each card in his opponents' hands. You win a game by accumulating 11 points (two players), 21 points (three players) or 31 points (four). An opponent can only have up to 5 cards in a hand at a time, so you can see you'd need to play at least three rounds to get a winner in a two-player game. At left is the Milton Bradley mark from the U.S. version of the card game. 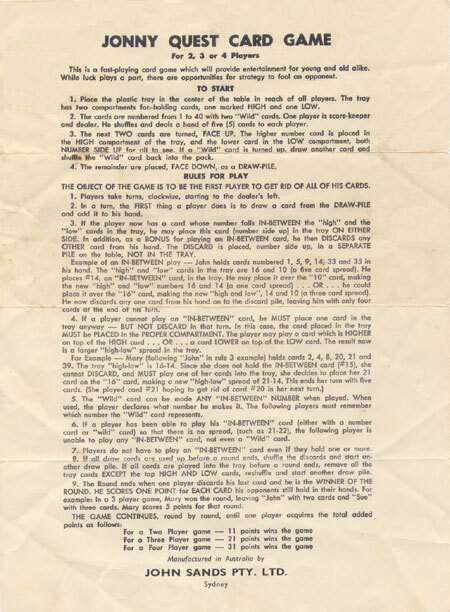 Below are the 16-page score pad and some of the playing cards. This is the instructions sheet from the John Sands version. The U.S. instructions are printed inside the box lid. Both sets of rules are identical except for the manufacturer's credit at the bottom. The copyright on the outside of the box is 1964 but, on the Milton Bradley instructions, there's a 1965 copyright. 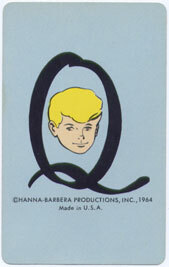 On the box is the "official" Quest File O-37 logo.